For many people, building with Legos brings back fond memories. For Mike Schropp, the memories are still being built. Schropp loves Legos, often incorporating them into technology. For his latest project, Schropp built a 12-core PC tucked into a custom made case he designed using some 2,000 black Lego bricks. The finished product is not only awesome looking, but also energy efficient. Schropp was interested in building a machine that could contribute some of its computing power to a community grid, helping crunch data to solve medical challenges. 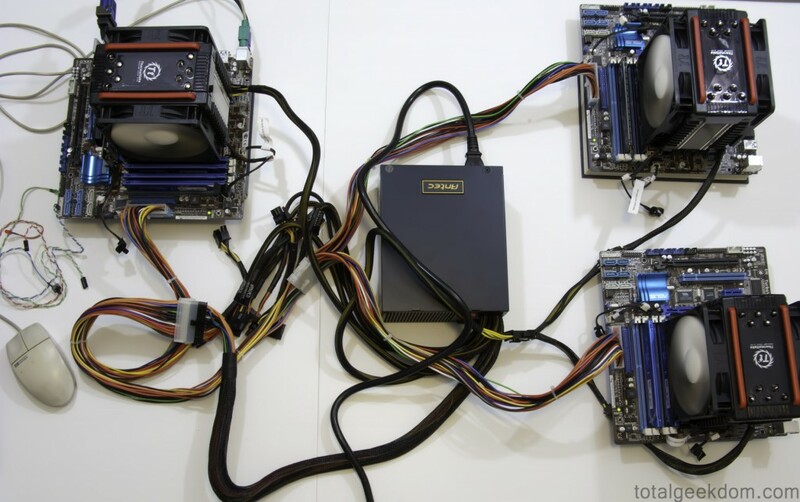 He originally intended to build a machine from scratch, but thought adding a fourth computer to his home seemed excessive. Instead, Schropp challenged himself to optimize and speed up his existing setup by combining the best of his machines into one super box. He hoped to spend no more than $2,000 on parts, and to build a machine that could process 100,000 “points” per day towards the World Community Grid. Since the machine was intended to crunch around the clock, energy efficiency was of particular significance in the design process. With help from his collection of Lego bricks, Schropp turned three computers into one. 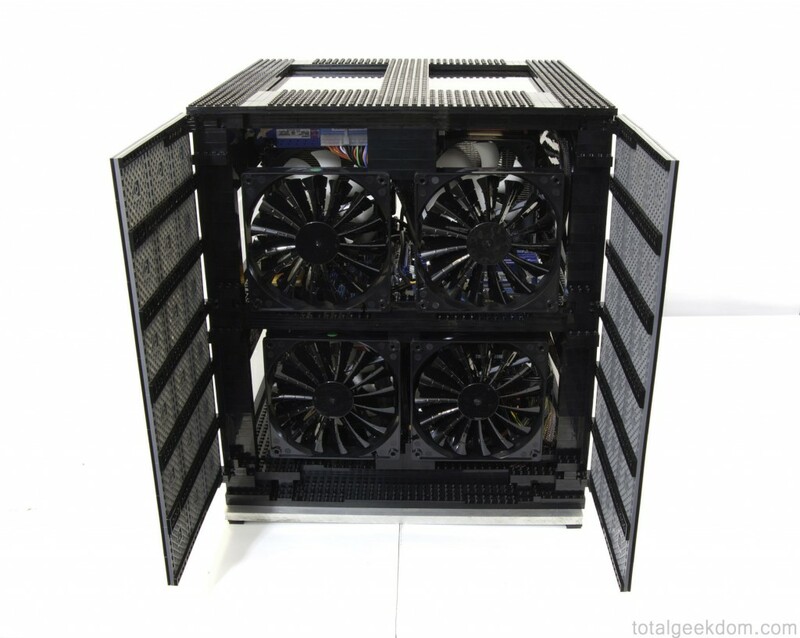 The finished product contains a trio of CPUs, coolers, motherboards, SSDs, DDR3 memory and eight fans. The unit runs on only one power supply, which Schropp modified to power all three systems. 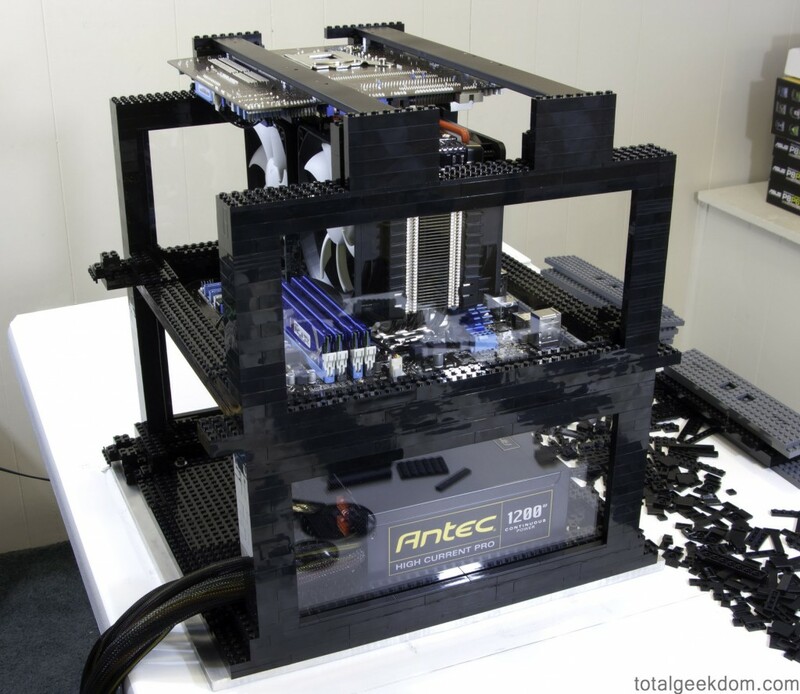 Schropp designed the Lego case to allow for as much airflow as possible between the CPUs and motherboards. Through the new, giant box, Schropp’s ‘folding farm’ contributes to humanitarian and medical research using less power than the sum of three boxes running independently. The three-in-one box consumes approximately 670 watts of power to crunch about 135,000 points per day, as compared to just one of Schropp’s old workstations PCs, which used 350 watts to crunch close to 10,000 points per day. Even so, the power supply is greater than what the system needs, in anticipation of adding another level in the future.